Questions are now turning to forced relocations. Asked what the impact of relocation on Inuit culture and language, Idlout-Sudlovenick says that “I wouldn’t call it an effect on culture and language. It was being moved from one location to another, and leaving your family behind, and having to relearn… in an area that you were not familiar with.” Speaks about hunting patterns, seasonal patterns, and wildlife. Davidee Anigmiuq brings up the example of Iqaluit's territorial high school. When children from communities began coming to Iqaluit for school, there was much less Inuktitut spoken in the city, because they could not understand each other's regional dialects: "they all reverted to English." Asked if she had any suggestions on how people can heal from the effects of reconciliation, Davidee Anigmiuq says that it's only recently that people have begun to speak their truth. "It was only when somebody believed Inuit that it started being exposed." Idlout-Sudlovenick says that there are other groups across Nunavut doing the work QTC is doing in the Qikitani region. "Even now, we still get calls from people who want to tell their stories." She says that there are many people who are now ready to give their testimony, but the commission is no longer doing hearings. Says that people are starting to speak up. That's the end of Elizabeth Zarba's testimony on behalf of ITK. Sarah Beamish retakes the stand, this time on behalf of the Association of Native Child and Family Services. Beamish asks Elisappe about the amount of people who access their centre that have had welfare services play a role in their lives. “We have had an overwhelming amount of people.” Talks about the lack of services for those in the welfare system, in particular mental health. She also talks about how those in the system have, in her experience, been cut off from family and from cultural services, often sent to centres or families in the south. "If you don't have that bond any more with parents or family, you can be seen as an outcast... In the times when people were being sent out for TB [for example], that bond was lost." Beamish draws a connection between the traditional Inuit punishment of banishment - traditionally an extremely serious punishment - and this loss. Davidee Anigmiuq agrees, and also draws a connection to people being "banished" to Iqaluit in order to access health care or other services. Next question is for Aksalnik: would you say Inuit children are still affected today by the need to travel south for medical treatment? Aksalnik: yes. She speaks about her grandmother being sent south for TB treatment in the 1950s, leaving her 2-year-old son behind to be raised by her great-grandmother. "When my grandmother came back, there was no connection between mother and son. It had a profound effect on everybody, being sent away for that long." She adds that people still need to leave their children behind today when heading south for treatment. Beamish's questions have ended. 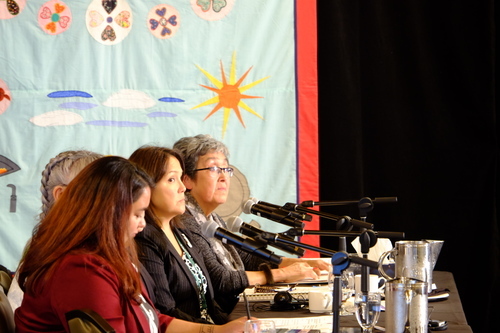 Catherine Dunn from the MMIWG Coalition of Manitoba is the next to ask questions of the witnesses. Dunn points to Elisappe testifying that her centre faces difficulties with securing funding on a short-to-medium term basis. How would she like to see her centre funded? Davidee Anigmiuq: "Unlimited multi-year funding." Biggest laugh of the day from the room. She talks about how unstable funding makes it difficult to meet the needs of her centre on a consistent basis. “It’s important to implement things that work for us. Made by us, for us.” Asked if they should be equal partners with their funders, she agrees and says it's important for their understanding. She then speaks about the advantages of working with regional Inuit organizations - she can go to them any time, and they have consistent employees and relationships. Says that when the federal government sends someone up to speak with them in person, it is appreciated and "so important." Dunn now turning to the QTC witnesses. Her first question is regarding the evidence of forced relocation - between the 1950s and 1975. Points out that it's very recent, and had direct impacts on the witnesses. Dunn asks what role the RCMP played in relocating people to other settlements or areas. Idlout-Sudlovenick: "There were different groups responsible." 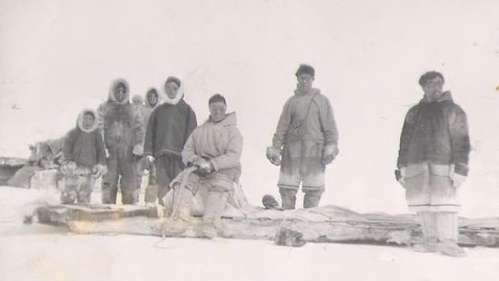 Points to Hudson's Bay Company, RCMP, establishing different posts in Qikiqtani region, government agencies through creating camps or the DEW line. The RCMP role was mainly around establishing posts, in particular one on Devon Island, she says. Q: If you didn't want to relocate as a family, who would be involved in the physical relocation? The RCMP? A: "At that time, yes." Dunn then confirms with the witnesses that the RCMP was the principle organization involved in the dog slaughter. She then asks about medical relocations for TB, Idlout-Sudlovenick says that they were responsible for bringing people to trading posts to be picked up by boat. Dunn asks if RCMP would physically put people on the boat if they refused, Idlout-Sudlovenick says that she thinks most people would go even if they didn't want to out of a sense of responsibility for their community's health. Dunn is drawing a line between the cultural differences between Inuit and RCMP with her questions. "Being treated not gently, in terms of a removal, or being sent south for TB... if the RCMP was doing that removal, that would be quite traumatizing." Dunn points out the transient nature of RCMP officers in Inuit regions - moving in and out of communities and training one another. Idlout-Sudlovenick says she's not sure of the internal training policies. Said that they would often bring in a new officer on the ship that brought out the old officer. "Often, it was the special constable providing training, in particular land survival." Dunn asks if RCMP members were reliant on community members for their own survival due to the harsh conditions. Idlout-Sudlovenick agrees. "And yet, even now it is the RCMP who are the authority figures in these communities, who represent justice on a day to day basis." Idlout-Sudlovenick: "yes." Very quick back and forth here. Idlout-Sudlovenick says that former special constables and other community members are still waiting for recognition from RCMP for the service they provided. Special constables were often moved from community to community as well, she says, leaving families behind. She adds that the special constables' wives were often expected to make winter clothes for RCMP officers, with no pay offered. Here's a photo gallery we put together on 2016 celebrating the role of special constables in the North. CBCInuit special constables as guides and cultural liaisons between the RCMP and the Inuit: guiding patrols, acting as interpreters and hunting for food, and helping out at the detachment. In another quick back and forth, Dunn confirms with the witnesses that RCMP originally came to the region to establish sovereignty and not to mete out justice, and that Inuit were able to do that themselves on their own before they arrived. Dunn: "I am struck by the suffering, particularly, of your communities in the North. In your case particularly, the lens that I see it through... in your case, the Northern families here, they lost their relationship with the land permanently throughout those relocations." Idlout-Sudlovenick clarifies that some people did go back, but many people did not. Dunn's time has expired. We will now take a 20 minute break. Back at 3:05 PM ET. We are back. Erica Beaudin with Regina Treaty Status Indian Services is next to ask questions of the panel. She is emotional as she introduces herself and thanks the panel for their testimony. Elisappe gets another laugh out of the room as she has difficulty getting her microphone to turn on: "I worked for CBC, so I should know." Davidee Anigmiuq now speaking about memories of her mother. Fighting back tears, she tells a story about how she told her mother one day she didn't want to go to school, and her mother said: "that's OK, stay home. You'll learn more here." Beaudin asks Davidee Anigmiuq how she believes her parents coped raising their child in a world where it was not possible to do so in the way of generations past. "Inuit people are resilient," she answers. Speaks about her memories of her father as a provider, and her mother making clothes and deciding how food was distributed. "The partnership between a mother and father was very important in Inuit culture," she says. Beaudin says she can relate to Davidee's story of parenting out of fear, asks if she used both traditional and western methods in her healing journey. Davidee says yes, she did - including both healing circles and programs in the Inuktitut language. Davidee is asked about her children. She says that her son is speaking Inuktitut to his children, and her daughter is encouraging Inuktitut as well. Her role as a grandparent, she says, "is to love them." Asked if communities can move beyond "revolving around funding," Davidee Anigmiuq speaks about how more and more people are speaking their truth, and the importance of teaching culture to youth. Asked about the role non-Inuit can play in helping Inuit reclaim their culture, Davidee Anigmiuq says: "believe in us. Be open, be welcoming." Turning to Idlout-Sudlovenick, Beaudin asks if there would be value in creating an Inuit ombudsman for RCMP. "I think so," she says. "I believe so."